Hilary has a home! 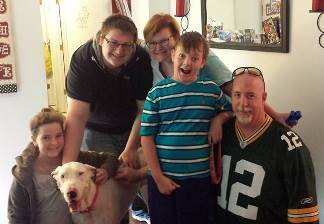 - Rocky Mountain Great Dane Rescue, Inc.
Hillary has a home with John & Shannon in Lincoln, NE!! John & Shannon have 3 children (ages 17, 11, & 9) whom are all thrilled to bring Miss Hilary (soon-to-be renamed Lexie) home. Hilary will be the family’s first Great Dane. They currently have no other pets and are looking forward to showering Hilary with their undivided attention. They met Hilary at the NE –event held this past weekend and it was love at first sight! They can’t wait to bring her home. Way to go, Hilary!